An inspiring and uplifting compilation of creative and original aphorisms and reflections that offer support, solace, serenity, strength, and hope to anyone who has survived a painful childhood or traumatic event in their lives, including addiction, whether their own or that of a loved one. With vibrant, evocative illustrations throughout by Nevada artist Lynne Adamson, Claudia’s transformative insights provide many moments for daily reflection on issues such as trust, denial, self-acceptance, forgiveness, and faith. Use this book in whatever way supports you at any given time. It may become a part of your morning or bedtime ritual. Perhaps you'll carry it with you, keep it on your desk, or in your car. You never know when you might need a moment of grounding or inspiration. The messages may offer a source of conversation among friends and family. At the back of the book you will find a few blank pages to note thoughts or sayings that you want to add for yourself. You have the right to say No. When you say No you are actually saying Yes to yourself. Your strengths are more powerful than your vulnerabilities. 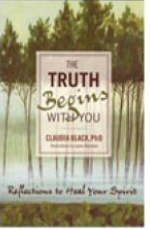 Click the button below to add the The Truth Begins With You to your wish list.